In classrooms all around the world, the use of Chromebook devices as an emerging educational tool has transformed the learning experience. 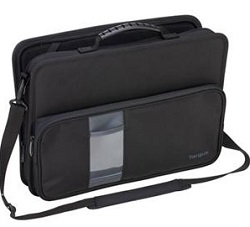 The Targus 14" Work-In Case for Chromebook exceeds classroom durability and functionality standards. Protecting your investment in Chromebook technology starts with Targus. From its hard-sided shell to its rugged, anti-slip base - this case solution provides all-around protection for any student on-the-go. As tough as it is on the outside, the interior microfiber lining also safeguards your device from scratches and dust. This case offers students the flexibility to learn anywhere and worry-free with its integrated work-in functionality that includes a charging port for easy access - even when in a charging station. Plus, store accessories in a convenient, zippered pouch.